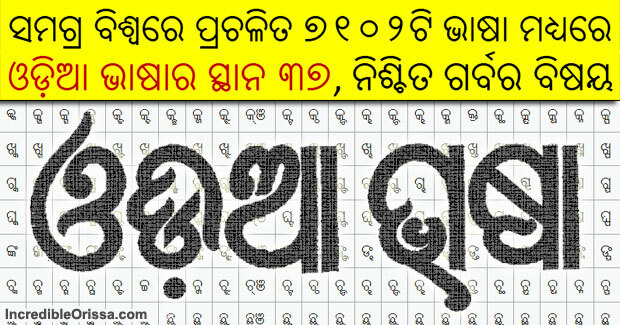 According to Wikipedia, Odia (Oriya) language ranks 37 among 7102 languages of the World. And its rank is 10 among 29 Indian languages. Odia is the official language of Odisha (Orissa) and the second official language of Jharkhand. 33 million people in India speak this language. Odia is the sixth Indian language to be designated a Classical Language in India on the basis of having a long literary history and not having borrowed extensively from other languages. Odisha was the first state formed on linguistic basis, but we have a chief minister who cannot speak Odia even after so many years in power. Reiterating its demand for provision of punishment for violation of norms under Orissa Official Language Act 1954, the members of Bhasa Andolan (language movement) on Tuesday threatened to burn down the Bill in full public view, if the State Government fails to act within a week. “The Odisha State Legislative Assembly has passed Orissa Official Language Amendment Bill on September 28 this year. But it is unfortunate that while there is punishment against any contravener of any Act, no punishment has been prescribed for contravener of Orissa Official Language Act”, said a language activist and President of Bhasa Andolan Subash Chandra Pattanayak. No doubt Sanskrit is the oldest language of India. It has got Classic language status along with Tamil. As per Manorama Year Book published before 1998, Oria is the nearest to Sanskrit than other languages of India(North). Oria is not adopted any Parsi or Urdu words. It has also not adopted any European words. It remains original. If you adopt any classical language for international communication, we may get set back. The mother language of every odia people have odia .we can speak and write it. Odia/Oriya language has been widely influenced with Bengali, Bhojpuri, Maithali and sanskrit. Its a very old language and have lots of classical literature. But We have new challenges in 21st century. Old literature /classical language can only add glorify our past civilization and reach to common mass. But teaching instruction in only odiya would cause catastrophic failure to millions of lives. This is the time to know odiya but study in Hindi/English language to compete with rest of the globe. Most of the Odiya people prefer to work in South india, only because they are not much competent with rest of north india. Its a time to scale up proficiency in English and progress on globe. Even this comment in available in English not in odiya. Lets not fall in language politics, scale up our proficiency and conquer the world. Every Odia people speak and write Odia. U have a problem with you when u tell “Most of the Odiya people prefer to work in South india, only because they are not much competent with rest of north india”. because Odias either can manage with half/English or half/Hindi in South or finally in their local language . But in ur north, ONLY Hindi and Hindi need to be spoken in PERFECT manner otherwise north with screw like anything!!!!!!!! 2) Odias also prefer to work in Southern part of India because in South, people prefer to take rice and they dont force any food habit on outsiders. Even north Indians like you can take Roti here 24/7. But in your north, the situation is different. Everyone is forced to take Roti/Chapati as rice is imported very less and served in the amount of pickle to everyone FORCIBLY. Mr TMishra, Am I right? If Northern Indians are that much competent, then there should not have been this much high population in ur north. If northern indians are so much talented, they shouldn’t have protested against the ENGLISH language test in IAS. Are they afraid like you? Mu ODISHA ru au mu mo ODIA bhasa ku bhala pae au sammana die.